You will all recall William and Kate's recent visit to the Royal Marsden Hospital, while there Duchess Kate was touched by one little boy in particular, Nine year old cancer patient Fabian Bate. After briefly meeting him and his parents Kate kindly promised to leave a message on Fabian's blog. However, Kate decided she wanted to send Fabian something even better - a personal letter. The Bate family were stunned to discover the letter from the Duchess of Cambridge. 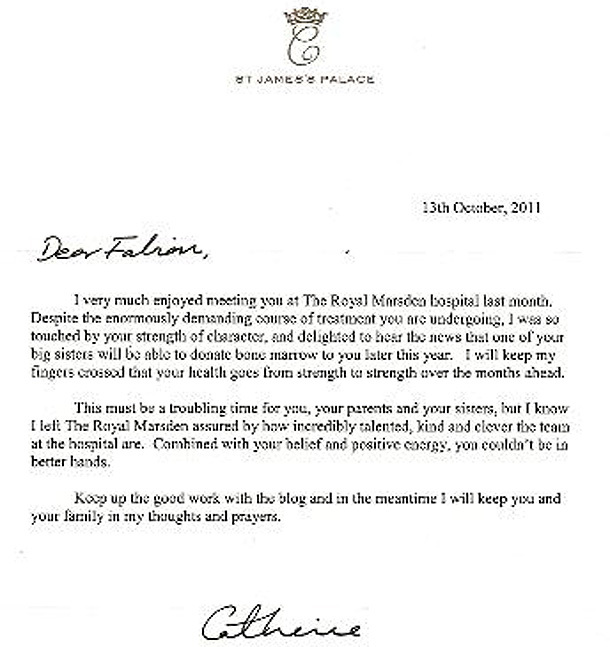 Kate wrote "I was so touched by your strength of character. I will keep my fingers crossed that your healthy goes from strength to strength". An incredibly kind gesture on behalf of Kate and this proves what a caring person she is. As a Royal she meets a vast number of people but this little boy touched her heart. The letter now has pride of place in the Marsden family home. Fabian Bate's dad Darrell said "She really personalised it and obviously remembered him". I think it's wonderful that she kept her promise to Fabian. It obviously meant a lot to him. That's so sweet! Yay for Kate! I love here!